The Gannon University men’s wrestling team picked up two impressive conference wins on back-to-back days over the weekend, defeating Pennsylvania State Athletic Conference opponents Millersville and Shippensburg. On Friday, the Knights whipped 25th-ranked Millersville, 33-12, at Millersville, and on Saturday, Gannon continued its road success by beating Shippensburg, 33-9. In addition to the results on the mat, the Knights learned Monday that they were ranked No. 21 in the initial set of National Wrestling Coaches Association (NWCA) Division II dual rankings. In the win over Millersville, freshman Nick Young (141 pounds) and redshirt senior George McGuire (157) both recorded pins for Gannon. Redshirt junior Anthony Williamson (184) and sophomore Freddie Nixon (197) both recorded decision wins, while redshirt freshman Joel Leise (174) added a major decision. Sophomore Dom Means (149) also contributed a technical fall to the Knights’ winning effort. This match was McGuire’s first action in nearly seven weeks. Coach Don Henry understands the importance of the veteran McGuire’s presence in the lineup. McGuire, who is ranked No. 1 in Super Region One and No. 5 in NCAA Division II, recorded what was then his team-best eighth pin of the season Friday. McGuire also recorded his 14th win of the season, which tied sophomore Jacob Dunlop (125) for the team-high. Dunlop recorded a win on Friday via forfeit. In the win over Shippensburg, the Knights got off to a roaring start by winning the first seven matches, which propelled them to an early 30-0 lead. Dunlop (125) and sophomore Austin Hertel (133) gave Gannon an 8-0 lead with consecutive major decision wins. Dunlop’s major was his team-leading eighth of the year. After McGuire (157) extended the Knights’ lead to 18-0 with a major decision win, sophomore Connor Day (165) and Leise (174) capped the steaming start with back-to-back pins. Day’s pin marked his ninth of the season, which is a team-best. 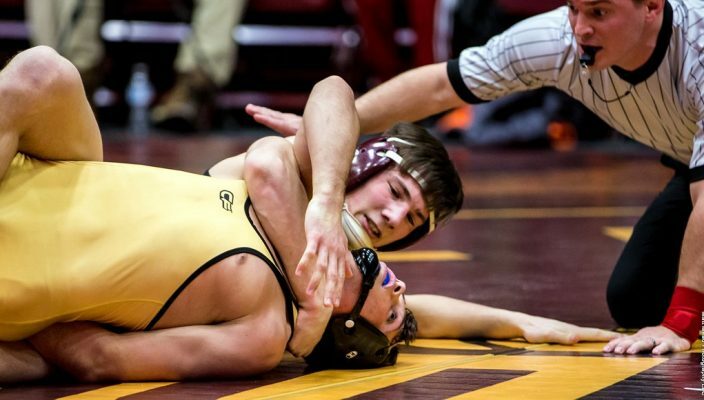 Young (141) and Means (149) both recorded decision wins during Gannon’s impressive start. Nixon (197) also added a decision win for the Knights on their way to back-to-back conference wins. Saturday’s win capped an impressive weekend by the Knights and Henry knows the importance of these two victories. Gannon’s men will conclude the regular season when they host Mercyhurst in another conference match at 7 p.m. Wednesday, Feb. 13, at the Hammermill Center.